The Gilded Slipper: Hands Up for Winter! Winter is on its way and, in some areas, has already arrived. 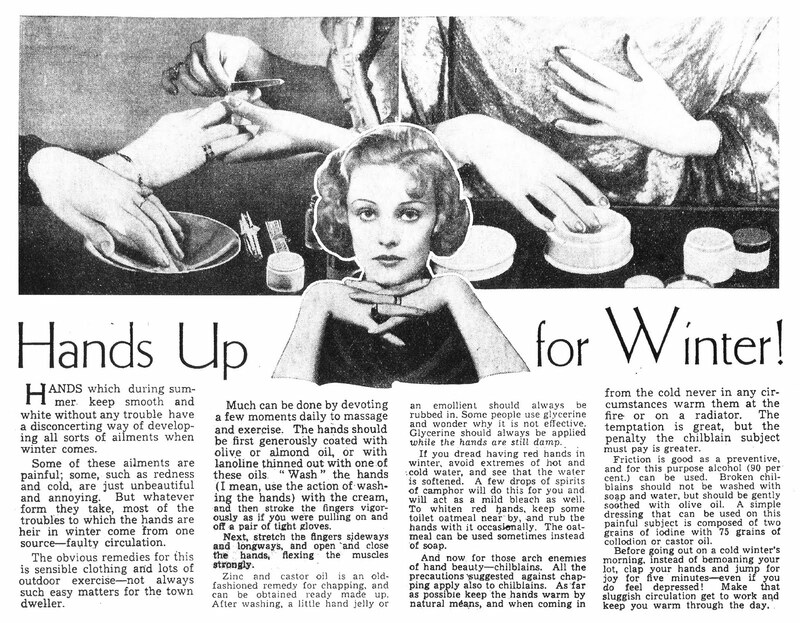 I thought this article would be very fitting to help you ladies keep your hands looking lovely through the season. This is one of the articles included in the book, What Every Woman Should Know: Lifestyle Lessons from the 1930s, by Christopher and Kirsty Hudson. "Hands which during summer keep smooth and white without any trouble have a disconcerting way of developing all sorts of ailments when winter comes." The article explains that some winter ailments are painful, while others are "just unbeautiful and annoying." Most of the problems hands suffer in winter, however, are due to "faulty circulation"! Here's how to prevent some issues. "Much can be done by devoting a few moments daily to massage and exercise. The hands should be first generously coated with olive or almond oil, or with lanoline thinned out with one of these oils. 'Wash' the hands (I mean, use the action of washing the hands) with the cream, and then stroke the fingers vigorously as if you were pulling on and off a pair of tight gloves." "Next, stretch the fingers sideways and longways, and open and close the hands, flexing the muscles strongly." "After washing, a little hand jelly or an emollient should always be rubbed in. Some people use glycerine and wonder why it is not effective. Glycerine should always be applied while the hands are still damp." "If you dread having red hands in winter, avoid extremes of hot and cold water...To whiten red hands, keep some toilet oatmeal near by, and rub the hands with it occasionally." To avoid chilblains, "as far as possible keep the hands warm by natural means, and when coming in from the cold never in any circumstances warm them at the fire or on a radiator." "Before going out on a cold winter's morning, instead of bemoaning your lot, clap your hands and jump for joy for five minutes--even if you do feel depressed! Make that sluggish circulation get to work and keep you warm through the day." I need to take a lesson from this - my hands and cuticles are horrible dry at the moment.